Tuesday March 26th 1878 We concluded to put of our company till next week so I sent them word to that effect. I sewed all the forenoon & did a big ironing in the afternoon. Win was over a little while. Hatt went to the concert in the evening and Lee, Mollie and I spent the evening very pleasantly at Wins. I got some patterns at Mrs Grays tonight. Weather warm and cloudy. Wednesday March 27th 1878 It rained all day. Uncle Jim came after Mollie this morning. I finished up one suit of Hatts under clothes. And cut out a polinaise I worked on it till late in the evening. 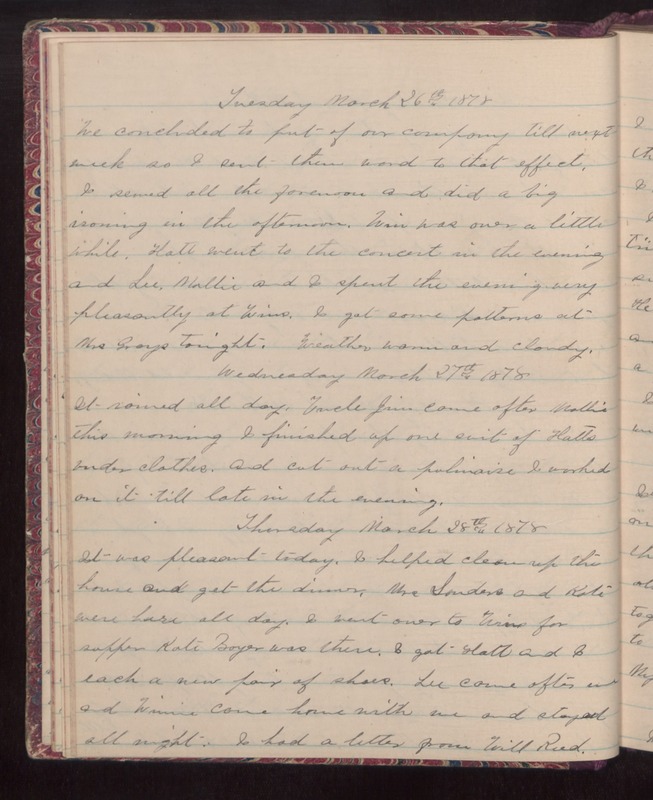 Thursday March 28th 1878 It was pleasant today. I helped clean up the house and get the dinner. Mrs Sanders and Kate were here all day. I went over to Wins for supper. Kate Boyer was there. I got Hatt and I each a new pair of shoes. Lee came after me and Winnie came home with me and stayed all night. I had a letter from Will Reed.